Oops! Thanks to the fans below who noticed these words are probably not ones Marilyn Monroe would have said. 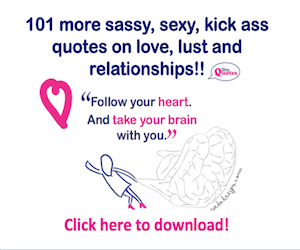 For a link to more quotes that have been attributed to Marilyn Monroe which likely never crossed her luscious lips click here. Unfortunately there are no sources to confirm that Marilyn Monroe ever said this, and it is also not in line with her character, as frequently in her life, when she was betrayed, she would cut the person from her life altogether. The other quotes attributed to her on your site are all ones that have identifiable sources from interviews. It is a shame this one doesn’t have the authenticity though. Hmmm. As far as I know, there are no sources to say she DIDN’T say it. It’s actually not a poster that I built myself. Do you have evidence to indicate who may have said or written it? Also, I’m a bit perplexed as to why this quote has two comments when the hundreds of others quotes on this site have none to speak of. Do you and April VeVea know each other? And why are you so concerned about the accuracy of this particular quote? No we do not know one another. This has been shared in multiple groups and it is rediculous to have to keep saying why it’s fake. You have 238 shares but how many of those are actually people who believe it or people who have spent years researching her? What reliable source do you have that says she said it? None because this is extremely against her character. Marilyn was someone who held a grudge. If she felt wronged by someone she would cut them off. None because this quote has just made the rounds over the past year and has no original source. This was probably made by a 16 year old girl. Your other quotes are very easily traced to her. This? 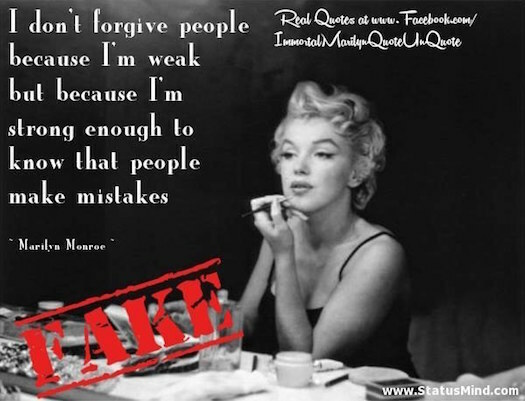 Absolutely not a Marilyn quote and casts doubt on anything you post. well, as I said you may be right. I didn’t produce this quote, I shared it. I’m not particularly invested in it one way or the other. So what is it that you want? That I should take it down? p.s. sorry for not replying sooner – hadn’t clicked to get notifications of new comments, so only just seen this! Thanks Gabriella. I’m not in the least bit offended. On the contrary. I’ve replaced the meme and put in an explanation. 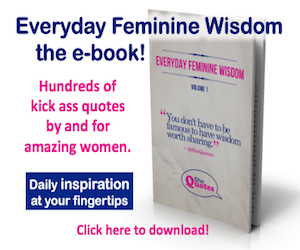 I also run a website called amazingwomenrock.com and what I suggest is you do a guest blog post for amazingwomenrock.com with links back to quotes on she quotes, and maybe a few picture quotes within the guest blog post as well. If there’s enough maybe we could even do a series…? If you have Skype, we could talk about the details – much easier than writing back-and-forth.